How do epigenetic changes affect an entire organism, instead of just individual cells? Shouldn't it just affect the cell(s) that have had their DNA affected? One really important thing that epigenetic marks do is define the different cell types and organs that make up our body. Epigenetic marks can change how a cell reads the DNA instructions. This causes some cells to read certain genes more, while others will read those same genes less. These differences help give us the wide variety of cell types in our bodies – even though they all have the exact same DNA! When epigenetic marks change in the cells of one tissue, it affects how genes are expressed there. This could change how that part of your body acts, which can be enough to affect you as a whole! Although all cells have the same DNA, they can have different epigenetic marks. Let’s dig into this a little bit deeper. First, what even are epigenetic marks? The information in our DNA is organized into genes. But a single cell doesn’t need all the genes in our DNA. 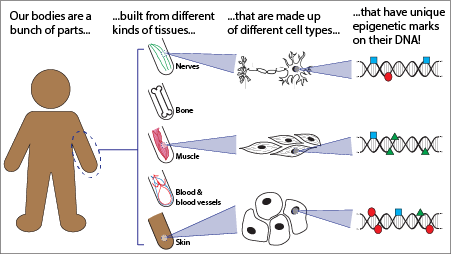 For example, a skin cell doesn’t need to use the genes that make muscle fibers. In a skin cell, the muscle genes would be turned “off”. And in a muscle cell, those muscle fiber genes would be turned “on”. Whether a gene is “on” or “off” depends on the epigenetic marks around it. These marks are chemical tags on DNA. They don’t change the DNA sequence (so it’s not a mutation) - instead, they change how the DNA is interpreted. But it’s actually not just an “on”/ “off” thing - genes have a whole range of activity levels. There are genes that are super active and get read a lot by our cells, and there are genes that are less active and don’t get read as much. Skin cells and muscle cells will need to turn “on” the genes that help use energy – all cells need energy to live! But a muscle cell is going to need a lot more energy than a skin cell. In a muscle cell, the genes for metabolism and energy will be more active. You can think of epigenetics like highlighting and crossing out words in a sentence. You aren’t changing the words themselves, but you’re changing how they’re interpreted. This is exactly what’s going on with our DNA and epigenetics. Epigenetic tags can be like highlighters for a gene, saying “read this gene a lot!”. Or, they can be like crossing a gene out, saying “don’t read this gene!”. Epigenetic marks are why different cells in your body look and act differently, even though they all have the same DNA: they’re reading different parts of your DNA’s instructions. Epigenetic tags change how our cells interpret the information in our DNA, just like crossing out or underlining words can change the meaning of a sentence. But how can epigenetic changes in one cell type affect an entire organism? Let’s pretend that I start doing as many push-ups as I can, every day. What will happen? The cells in my arm muscles are going to be working harder. They’ll need to read lots of the genes that help to use energy, and the genes that help cells multiply and grow. This might lead to some epigenetic changes. Because of these changes in the muscle cells, the entire muscle could change. My muscles will grow, and I’ll start getting some serious biceps! And that’s not all. My muscle cells are now using more energy, so that’s going to affect the rest of my body. It might change how my digestive system breaks down food, how efficiently my heart works, or how often my brain tells me that I’m hungry. So even though the epigenetic changes started in my muscle cells, they changed how my muscles worked. This spread out and affected other parts of my body, too! There’s a lot that we still need to figure out about epigenetic marks. I mentioned that some marks are like highlighters for genes, and some are like crossing a gene out. This is because there are different kinds of epigenetic marks, which affect our DNA differently. How these epigenetic marks work together, and all of the reasons why they get put onto and removed from our DNA, are still a bit of a mystery! Utah Genetics has a great Introduction to epigenetics, with some great videos and online activities. Or check out this Fact sheet on epigenomics from the National Human Genome Research Institute. Roadmap Epigenomics Consortium et al. "Integrative analysis of 111 reference human epigenomes." Nature. This paper is from the Roadmap project (or more formally, the NIH Roadmap Epigenomics Mapping Consortium). They’re measuring tons of different epigenetic marks in many different cells and parts of the body, to understand how the different marks relate to how much genes get read.